Have you ever reflected on the first words of the U.S. Constitution? “We the people” certainly sounds inclusive, but a lot has changed in the nearly 250 years since it was written. The framers of our Constitution undoubtedly felt unified when drafting the document that would be our country’s roadmap for navigating future government, but, clearly, division has recently been escalating in the country. People have different views on how the Constitution should be interpreted and varying beliefs on just about every issue affecting government today. A country founded by immigrants is faced with finding a balance between welcoming new people into it and taking care of current inhabitants with what seems like fewer and fewer resources. “We the people” want many different things and we have a wide range of views on how we would describe the American Dream. Can we still be united? Considering all of our differences, are “we” still a unified people? One thing is certain: divided countries do not prosper. When people cannot come together around some type of agreed-upon mission, chaos ensues. We end up wasting precious time and resources fighting one another and stalling progress, instead of working together to make life better for all of us. But this struggle is nothing new. What is unique about our democracy is that when it began, we were not a country with a clearly defined history, heritage, culture, ethnic group or race. People living here were either immigrants or descendants of immigrants from a variety of European countries, along with a minority of others from Asia and the Middle East, as well as Native Americans and Africans, both free and slaves. How could our founders imagine this diverse group as “we the people?” Well, they didn’t, actually. When citizenship was first defined by the U.S. Naturalization Act of 1790, just three years after the Constitution was written, it was a quite narrow group who were considered citizens — white male property owners. Fortunately, the definition and accompanying rights have expanded over time, but only with a great deal of struggle. Today, in many ways we are an even more diverse country than we were at the time the Constitution was framed — ethnically, racially, religiously, politically and economically. Maybe that makes it even more difficult for us to agree on what our way of life should be. Social media, which allows viewpoints to be exchanged quickly and widely, seems to fan the flames rather than bring unity or agreement. It also makes it easy to seek out self-affirming information. 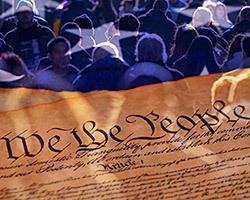 In a social environment that fuels divisiveness, is it still feasible for “we the people” to determine our own destiny — one in which all people can flourish? If we go back and look at our country’s founders, they didn’t always agree on what laws should be passed and how they should be interpreted. Debate was, and still is, a critical part of the process. But what has led to our democracy becoming a reality, and continuing to flourish, is the willingness to look for common ground and work things out, even with our differences. We must continue to do this even when we face new challenges. Finding common ground and implementing what is truly good for people must involve dialogue, rather than just debate. The goal of debate is often to “win over,” or “convince” others that a certain point of view is the correct one. Dialogue, on the other hand, invites ideas to be put in common and examined. It requires effective listening. It calls for an open mind and heart. It calls for a disposition of humility, in which we accept and recognize that there may indeed be truths and ideas in other points of view that are good for people. A big reason that a two-party system (and sometimes more than two) has generally worked well over the decades of our history is that it has allowed for different ideologies, philosophies and policies to be tried. The will of “we the people” has been able to be expressed through the electoral process, and as a result we have had some extraordinarily good times, and some not so good times. And the good and bad times have not been limited to any one political party. I refer not only to economic matters here, but also to policies and practices regarding education, the environment, social programs, infrastructure, foreign policy, and all the ways that “we the people” want to be governed and interact with the wider world both here and abroad. I remember one person at a previous employer with whom I found it difficult to work with. I thought she was highly critical, very demanding and unappreciative. I decided to sit down with her over lunch and invite a dialogue, to really listen to each other and have a conversation about what we both wanted for our working relationship. Even though we had very different styles, we were able to identify specific actions each of us could take to improve how we worked together, and were able to more clearly describe the results that each of us wanted — wherein we found many commonalities. We have achieved much through these characteristics, and they are often a great starting point for relating to those who are different from us. Another commonality is our pride for our country. The many opportunities available here are largely the result of the freedoms provided by our Constitution, and the hard work and innovations of our people. And we don’t keep our resources all to ourselves. Our country has a long history of helping people here and in other countries when they are in need. We have many things to be grateful for and to feel good about as Americans, even though our country, like all countries, is far from perfect. It’s important to take pride in our progress, while at the same time acknowledge we have a long way to go. As an example, we need to recognize that we have some drastic inequalities in this country, and there are many persons and groups who have been marginalized and forgotten. Rugged individualism and greed has often ignored, and even created, discarded people. If certain laws or aspects of society are fueling negative transformation, we need to start a dialogue so we can properly address it. Luckily, throughout U.S. history there have been many businesses, organizations and programs that “we the people” have established to foster important conversations and care for each other. These forces start small but can grow into something incredibly powerful, ultimately lobbying lawmakers, changing public opinion and effectively turning dreams of a better life into reality for fellow Americans. Today, for example, companies that belong to the Economy of Communion project are leading the way to create a new economy, and to help ensure that everyone has the opportunity to flourish and enjoy the life, liberty and pursuit of happiness promised by our Declaration of Independence. I challenge you to spend some time reflecting on what it means to be American, and to think about unity in terms of action. Our country has a long legacy of taking action to bring about the change we want to see. Instead of complaining, doing nothing, or burying our heads in the sand, our ancestors took the harder route that would ultimately lead to a better life for themselves and others. What is your American Dream, not just for yourself, but for your fellow Americans? What are the gaps between this vision and the current state of our country? Starting a dialogue about closing this gap might just be one of the most patriotic things you can do. Jim Funk is the owner of J L Funk & Associates, a consulting practice, and lives in Indianapolis.